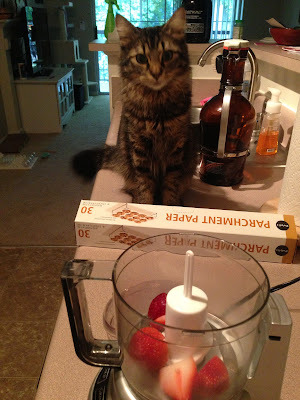 Baking buddy... who got kicked out of the kitchen. The doubled recipe gave me enough for four cake rounds, which I thought was ambitious to layer such a moist cake... but one turned out to be wonky (to Duke's eating pleasure) so I stacked three. To make the pan removal smoother, I used parchment paper to line the bottom of the pans. 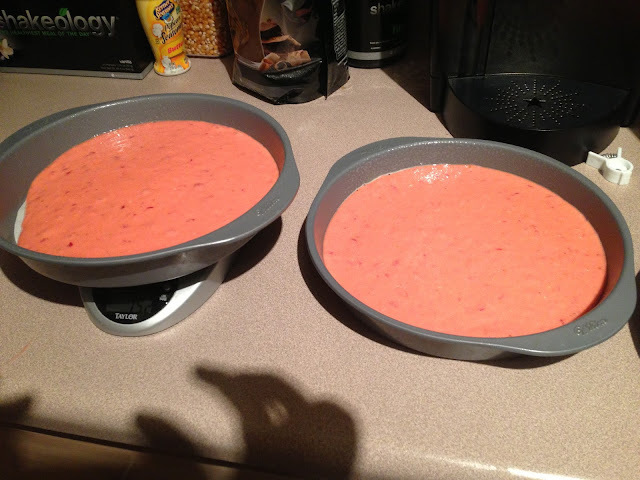 To make the layers even, I weighed the pans as I distributed the batter. I also chose to bake at a lower temperature for a longer baking time, so the cakes did not "dome" and therefore did not require leveling. I got all of these tips (parchment paper, weighing pans, lower temp) from reading various blogs. The internet is wonderful! Once the layers were baked, I stuck them in the fridge for cooling. Then, I stacked them with a layer of cream cheese Cool Whip Frosting in between. I used one tub of frosting to stack and crumb coat the entire cake. I then placed the cake in the fridge overnight. My layers held! I was so excited to see this little column in my fridge the next morning. I decorated the cake that night, with another tub of Cool Whip Frosting. 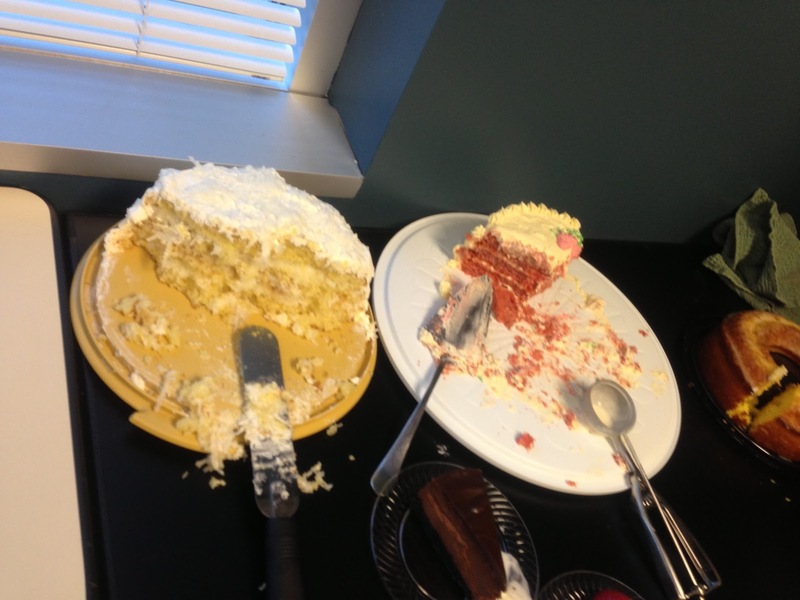 The cake was a huge hit! While I didn't win with the judges (I lost to a family coconut cake recipe), I think the fact that my cake was devoured was a personal win for me. I'm glad that I stepped outside my baking comfort zone and put the effort in to make a level, layered cake. Now I won't be so afraid to try it again in the future! Note: I wasn't asked to write this, but I can't say enough good things about Cool Whip Frosting. When I'm baking a cake, unless I make the frosting ahead of time, I just don't feel like doing more after the cake baking effort. 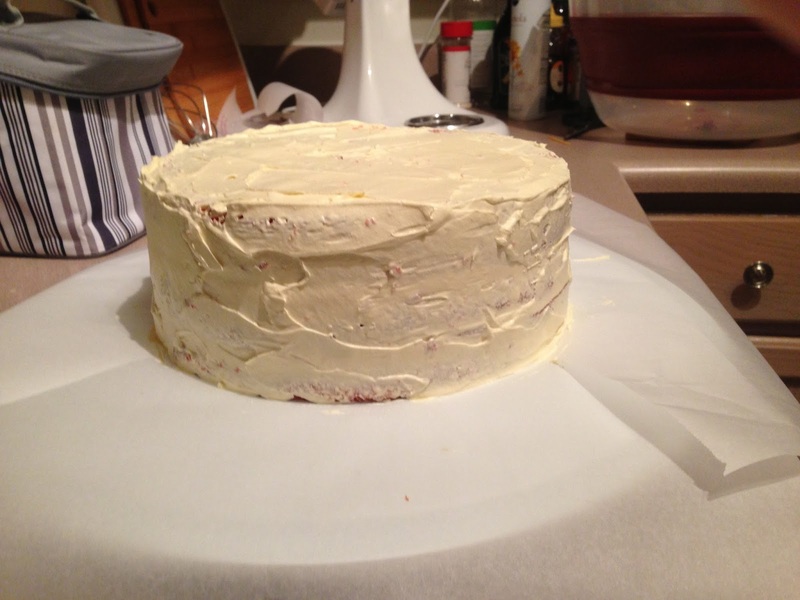 Plus, I felt on this super-rich cake I needed something that felt like a lighter frosting vs. buttercream. The Cool Whip stuff (found in the freezer aisle) is super easy to spread on the cake without picking up crumbs. Just make sure your cake has cooled! They have a vanilla version too, and the chocolate version that I used on the Starbucks Pike Chocolate Cake. This cake is a crowd-pleaser... I think I've made it for work nearly a half dozen times now, almost always by request. It's what I'm known for at potlucks, though I'd like to branch out a bit and try something new! I just can't say no when people ask for it specifically.